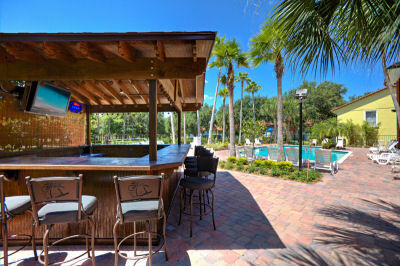 Legacy Vacation Club Lake Buena Vista in Orlando, Florida Near Disney! - Bid on a 7 Night Stay in a Studio or 1 Bedroom Unit! Enjoy 7 Nights at the Legacy Vacation Club Lake Buena Vista in Orlando, Florida! Legacy Vacation Club Lake Buena Vista puts you in the heart of all the Walt Disney World Resort attractions, and is within walking distance of great shopping, restaurants, and nightlife. In fact, the resort is less than two miles from the entrance to the Disney area. You will feel the magic the moment you arrive! Plus the resort features a swimming pool, hot tub, poolside beverage hut, tennis court & playground so there is plenty of family fun to be had on-site, and comfortable accommodations to return to after a day of fun-in-the sun. All units are spacious and fully furnished with everything you need for your Orlando vacation. We’ve thought of everything that can make your stay carefree and relaxing. All accommodations are smoke-free environments and air conditioned. Your Studio Unit will accommodate up to 6 and has a partial kitchen. “The Wooden Shack” Pool Bar – Now Open! Drop by for wine, beer, light snacks and poolside fun. $50 Security Deposit Is Required At Check In. Guest Checking In Must Be 21 Years Of Age. If Arriving Late, Please Contact The Resort In Advance For Check In Process.